The new £4.3bn terminal at Heathrow Airport will be ready in exactly one year, the scheme's planners have said. 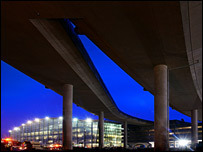 Terminal 5 will undergo six months of tests involving 16,000 volunteers before it opens on 27 March 2008. The tests will check facilities from car parking to flight journeys at the airport, the UK's biggest. Work on the terminal began in 2002 after a record-breaking four-year public inquiry prompted by local residents and green groups. The terminal will serve an extra 30 million passengers and the first flight to be served by it will be a BA service from Hong Kong. The passengers arriving from the Far East will be the first of about 40,000 to go through the terminal on its first day of operation. It will have platforms to serve both the Heathrow Express and London Underground's Piccadilly line. Shops at the terminal will include Harrods and celebrity chef Gordon Ramsay will open his first airport-based restaurant there. Heathrow chief executive Tony Douglas said 68 million passengers would fly through Heathrow this year "in ageing terminal facilities designed to accommodate around 45 million". He said: "When T5 opens and 30 million passengers move out of existing terminals, for the first time we will have space to breathe in the central terminal area. "We have a once-in-a-lifetime opportunity to redevelop the rest of the airport and bring it up to a comparable standard to T5." Friends of the Earth called for the government to end airport expansions plans, including a third Heathrow runway. "If ministers are serious about cutting carbon dioxide emissions Terminal 5 must be the last major airport expansion," said campaigner Tony Bosworth.